Looking for a way to feel Irish today but don't have time to cook like the Irish do? 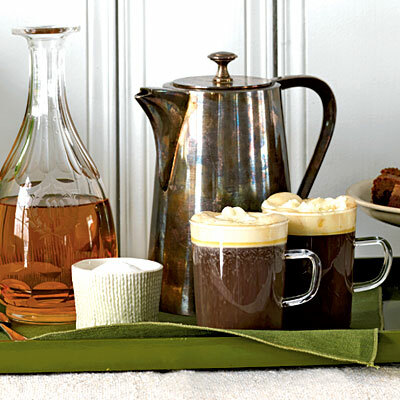 Here's a quick recipe for Irish Coffee. This easy recipe is adapted from Cooking Light Magazine, and can make anyone feel Irish today. 1. Place 1/4 cup whipping cream in a medium bowl and beat with a mixer at high speed until stiff peeks form (you can substitute the full-fat whipping cream for cool-whip). 2. Pour about 4 teaspoons of whiskey into each glass. 3. Add 2 teaspoons of sugar to each serving. 4. Add 2/3 cup of coffee to each mug, stir it until the sugar dissolves. 5. Add 1 1/2 Tbsp of whipped cream to each mug. What's the calorie content of the full recipe? This treat is under 150 calories, is low in sodium and cholesterol, provides a touch of calcium, and is not terribly high in fat. Should I Exercise at High Intensity?